Rock Hard is a downloadable microgame in WarioWare: D.I.Y. and WarioWare: D.I.Y. Showcase. It was released on March 17, 2010 in Japan, February 14, 2011 in North America, and March 18, 2011 in Europe. 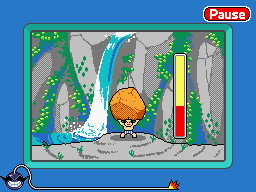 At the start of the game, a boulder falls on top of a sumotori as training, and a red bar to the right of the screen rapidly drains away. If that bar runs out, the sumotori is crushed under the boulder, resulting in a loss. The player must rapidly tap the screen multiple times so as to make the sumotori resist the boulder's weight, and keep the bar filled up. The game is won if the sumotori survives to the end. This page was last edited on April 4, 2018, at 19:33.